Have you ever had that dream before where you were in a room where the band members from NOFX were sitting in one corner and the vocalist from Less Than Jake was sitting in the other? Well, I haven't either. But if you did, you'd find the band, Just For Today sitting in the middle. It's always good to hear what the smaller punk acts from Southern California are playing because it's usually a foreshadow of what is about to come from the better-known acts in the near future. From Just For Today, we hear a different twist on what is going on in the SoCal underground. Their strongest point seems to be in picking out the best elements of other acts and blending them into an energetic, cohesive trio. Now don't get me wrong here. I'm not saying they aren't capable of writing original music that keeps people moving. In fact, the album shines most on these tracks. "Just Because" puts together a seamless track of some of the better melodic punk I've heard in a while. "Falling" easily slides into the same category. "L.I.N.U.S." has Blink-esque guitars combined with pondering lyrics to form another admirable track. Unfortunately, the other elements of the album suffer from two problems. First, it would not be a stretch to say that I've heard some of the tracks before, except the album was a big red condom and the album cover said "NOFX, Ribbed." A combination of lyrical style, backing vocals and the "stop-go" style of guitars lends the resemblance on "Me, Myself and I," "Conditioned," "Not Mine," and "Dude." Although the songs could get any crowd moving, there leaves something to be desired for in terms of originality. Second, the most insightful lyrics can be found in the second half of the album. Unfortunately, the tight-knit music of the first-half found a lapse of concentration in the second half. 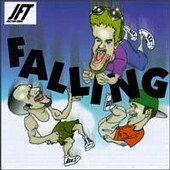 FALLING by Just For Today shows a lot of promise as a marker of things to come in incredible melodic punk. The key for this band to move forward is to combine their excellent music writing (NOFX-esque or not) with the lyrics of the second half of this album.